Good hotel near Fairfield Universty. Staff very helpful and friendly. Building could use a refresh. Where to find Bridgeport hotels near an airport? Where can I find hotels in Bridgeport that are near tourist attractions? There are a wide range of Expedia hotels to browse when it's time to start organizing your adventure in Bridgeport. 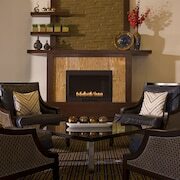 Within a short drive of Bridgeport's downtown area you will find 16 Expedia-listed places to stay. The Holiday Inn Bridgeport-Trumbull-Fairfield, is the perfect option for travelers as it's the most centrally situated hotel choice in Bridgeport. 9 kilometres (6 miles) from the center of Bridgeport, is the Delamar Southport. The Omni New Haven Hotel at Yale is situated 25 kilometres (16 miles) away. Alternative Expedia-listed accommodation options include the Danfords Hotel and Marina and the Three Village Inn. The broader Coastal Connecticut area is worth exploring too. Investigate Coastal Connecticut's lighthouses. Nature lovers should also take the time to to admire the region's beaches and coastal plains. Popular pastimes in this particular part of United States of America include hiking and cycling. Branford Center is 35 kilometres (21 miles) to the east of Bridgeport and is where you'll find Polished and Branford Center Historic District. If you'd like to spend a night or two in Branford Center, check Expedia's booking pages for the latest deals at the Holiday Inn Express Branford-New Haven and Days Inn Conference Center Branford New Haven. 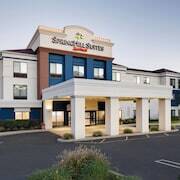 1 kilometre (1 mile) to the southeast of Bridgeport, you can also stay at Bridgeport Downtown South Historic District, which is home to the Holiday Inn Bridgeport-Trumbull-Fairfield and Stratford Hotel & Conference Center. The Housatonic Museum of Art and Lafayett Park are some of the most popular places to see in Bridgeport Downtown South Historic District. Get your sporting fix with a trip to Madison Square Garden, which is 85 kilometres (51 miles) to the southwest of Bridgeport. Book a hotel close to the action at the The St. Regis New York or the Mandarin Oriental, New York. Tweed - New Haven Regional Airport is 25 kilometres (17 miles) away from Bridgeport. Visitors who wish to stay nearby, you can easily secure a room via Expedia at the Courtyard New Haven at Yale or the New Haven Hotel. 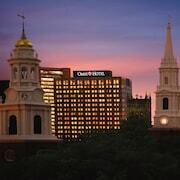 What are the most popular Bridgeport hotels? Are there hotels in other cities near Bridgeport? 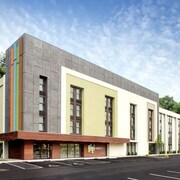 What other types of accommodations are available in Bridgeport? Explore Bridgeport with Expedia.ca’s Travel Guides to find the best flights, cars, holiday packages and more!